Last week, the Union cabinet approved the national offshore wind energy policy. 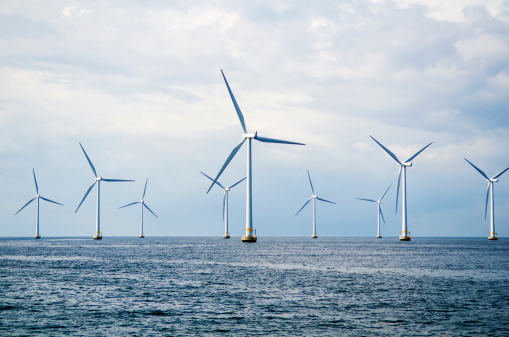 It is the first policy to govern the country's budding offshore wind industry. India has enormous offshore wind energy potential, but it remains unexploited. The Centre's approval has paved the way for harnessing of unexploited wind energy from India’s 7600-km coastline. With this move, the government aims to replicate the success of onshore wind power development in the offshore sector. It will also help the government meet its wind energy target of 60 GW by 2022. The National Institute of Wind Energy (NIWE) has been authorised as the nodal agency for allocation of offshore wind energy blocks, coordination with related ministries and agencies and other allied functions. The Ministry of New and Renewable Energy (MNRE) has been authorised as the nodal ministry to use offshore areas within the Exclusive Economic Zone (EEZ), which is 200 nautical miles from the coast. India ranks fifth in the world in terms of installed wind power capacity. Wind energy now constitutes around 66 per cent of India's total renewable energy capacity. However, the rate of capacity addition of onshore wind has fallen in the past couple of years due to policy instability and state-specific land acquisition issues. This is where offshore wind will have a role to play. Potential challenges of offshore wind include grid integration, resource characterisation and operation and maintenance of transmission infrastructure. Offshore technology is far more expensive than onshore wind, which raises the cost of generation. However, offshore technology also has distinct advantages such as higher wind speed and large wind resource. The capacity utilisation factor (CUF) for high-range offshore wind farms is higher than that of onshore technology. Hence, offshore wind power allows longer hours of operation. Additionally, it has the potential to meet the power demand of load centres on or near the coast such as Chennai and Vadodara. According to the offshore policy report, a preliminary assessment suggests that projects off the coastlines of Rameshwaram and Kanyakumari in Tamil Nadu have a potential of 1 GW each. The Global Wind Energy Council (GWEC) is already developing a roadmap for offshore wind in India, with particular focus on Tamil Nadu and Gujarat. Suzlon's assessment shows more than 1 GW of offshore wind energy potential along Gujarat's 1600-km coastline. For the Indian offshore wind sector to succeed, it is critical to create necessary conditions for long-term growth and reduce investment risks. With India joining the league of offshore wind power users, it now has the opportunity to carefully examine the successes and failures of European projects. This will help India avoid costly mistakes. India must ensure there is a clear, time-bound and quantitative target for offshore wind development and a roadmap to achieve it. The country must also maintain industry confidence by clearly establishing and articulating the objectives of the energy policy. Strong initial public investment and public-private partnerships are also required. Though the policy has been cleared by the Centre, it will take a minimum of three to five years for a pilot project to come up. Devansh Jain, director of energy company Inox Wind, says, "Considering the legal procedures, technology availability and fund allocation, offshore wind power has a long way to go to be price-competitive with the onshore sector." Since the government is committed to long-term infrastructure investments and has set ambitious targets for solar and wind power, this move will help clear many policy-related and inter-ministry issues. What happens to the local biodiversity?